Special thanks to our seasonal writer Starcat and her buddy Furu for bringing this to my attention just a few minutes ago! – Funimation would likely use their own dub artists for the show. We here at Moon Chase really don’t want to see this. The VAs of the original dub in Toronto all worked really, really hard to make the characters who they were and they really put Canada on the map for anime dubs. The show was also one of the big spark plugs that started the whole anime boom in the late nineties. To lose the majority of this cast would be devastating. These are voices that we all grew to know and a few of them have even expressed interest in returning to their roles if there was a redub or lost episodes dubbed. Now, let’s look at Pretty Cure. Toei is collaborating on the dub with Ocean Studios, and this partnership has produced wonderful results. Every episode that we have watched brings a happy tear to our eyes because this really is a dub to be proud of , hardly any cuts have been made. And it brings a sad tear to our eye because Sailor Moon never had this chance. So please, if you want to see your old familiar voices have another chance at your favorite character in Sailor Moon, let Funimation know at the bottom who you enjoyed and that you would want to see a redub featuring the old stars. On a side note, we’d also like to have Roland Parliament also have at the very least some input in the production. He worked extremely hard given the pressures he had from Optimum Productions to make certain edits to the series, to direct what we think were the best episodes of the series. He went above and beyond his role as a director to make sure that he put out a high quality product, sometimes having the dub actors stay past their call times (by a long shot) just to get the right take on a line. He would come home tired after a long day of dubbing, and then watch the next day’s episode in Japanese, and make notes. And then, this would all repeat again the next day. Sailor Moon was under a lot of pressure to put out 5 episodes a week! – Funimation seems to have the vast majority of Toei’s cards in their hands. Viz only has two Toei anime licenses – Boys Over Flowers and One Piece (which is actually in a partnership with Funimation). Bandai as far as we can tell has no Toei Licenses, and ADV has only one Toei license, Saint Seiya. ADV previously had the rights to Sailor Moon, and to make a long story short, they only got the rights to the subtitled version (and they received masters of poor quality) near the end of Sailor Moon’s licenses for North America. And it’s looking like I’m going to have to work on this Geneon article pretty soon, but they have been resurrected in Japan. If you are going to Animazement this is a major part of Moon Chase’s presentation at the Sailor Moon Universe Panel! Funimation is in a special position as well because they are now streaming a lot of Toei’s series for their on-demand service on their site as well (all subtitled). These include Air Master, Captain Harlock, Digimon Adventure 02, Fist of the North Star, Galaxy Express, Pretty Cure and Slam Dunk. So right now, it is looking like Funimation is the only option for a distributor for Toei at this moment. We here at Moon Chase happen to have spoken to a lot of independent anime/comic book store owners who praise Funimation’s vast selection, but they are not fans of their pricing strategies at all. Even some fans agree, with our own The Me finding the $60 price tag per volume of Ourah High School Host Club a little too expensive. In Canada especially, Funimation needs to really improve their distribution of anime across the country, not sending the bigger selections to only the bigger cities. This was the major issue with the release of the first two seasons – many Canadians simply did not have the chance to see ADV’s release of Sailor Moon in stores until very close to the license expiry. It was a sad day that Canadians could not purchase a show which had its dub produced in their own country. We encourage our readers in Canada and the US to also comment to Funimation about their pricing strategies and distribution, what they would like to see in their own cities. – Last , but certainly not least, is the issue of the final season, Sailor Stars. We are all dying to see it, however it doesn’t seem in these times that an unedited dub on television would air without any controversy. Sure, gender bending has done well late at night with the example of Cybersix, and Cartoon Network’s Adult Swim block has been able to keep any objections to a dull roar, but Sailor Moon is a girls’ superhero show, and many young girls back in the day did watch and love the show. It would be difficult to adapt some elements of the storyline towards the under 10 set. At this point, we would wholly support a straight to DVD release of Stars since that’s the only way that we think it could be in North America and work. Ideally, we’d also support a dub which aired late at night on adult-centered animation blocks in Canada and the US, however we don’t think that a dub aimed for young girls of that season could work. Nonetheless, we have all waited too long for Sailor Stars, so please leave your opinion on the series with Funimation. – Oh yeah, and there’s a couple other series we love on this survey too. Hayate the Combat Butler 2nd Season continues one of our staff favorite comedies and misadventures of a teenage butler, and K-On! is a teenage high school slice-of-life comedy about some girls who join a club, start a band, and have to deal with a guitarist who is a complete space case. If you enjoyed Ouran as a slice of life comedy, then you’ll love K-ON! too. Vote for these too if you can! Once again, that survey is located here. Fans, please join and watch our forums. In the next few days we will be planning a letter writing campaign, but we will not be posting any details on our blog posts. And we’ve got a few other things related to this that we have up our sleeves, so stay tuned. If any of you fans write any comments towards Funimation and would like to share them on the site, please send us an email! Breaking News: ADV And Geneon Merger Over? Readers, there is an update at the bottom of this post. To The Anonymous Poster: We would love to hear more about this, but we don’t really think that the comments are the best way for you to let us know exactly what is going on. We have an email address listed at the bottom of the page, but here it is in case you don’t want to go looking: Moonchasers@NOSPAMPLZTHXgmail.com (remove the NOSPAMPLZTHX). We promise to keep you anonymous – and won’t publish anything that you would rather us not post. Hey Moonies: we are treating this current Breaking News Story as Rumor. 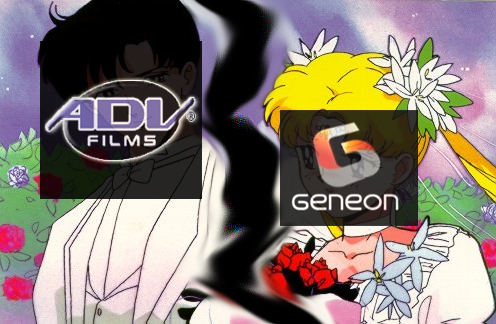 Two weeks ago we brought to your attention late breaking news of a proposed merger between ADV and Geneon, two anime distributors who once held licenses for Sailor Moon. This morning, an anonymous poster to that article notified us that the deal was on hold. And just a few hours ago, ANN also broke the news. This sad news comes after the other disheartening news that as we (and others) predicted, Geneon laid off many employees, especially those in sales. Also of note is that an Editor of ANN has admitted that their source was also anonymous. We’re not sure if our sources are the same , but we’re still unsure whether to call this news legit or not. We also thought something was up when one of our members last week spotted some Geneon titles in a store going for a little cheaper than they usually do. It’s also way too early to speculate what this could mean for Sailor Moon. Geneon’s North American distribution is up in the air at this moment. We really don’t want to see Geneon pull out of the North American Market – especially like this. Especially when articles like this one come out and say that many of the Japanese companies are setting up shop in North America just to manage their releases of anime. We apologize to fans for not reporting this earlier. All of our staff members are busy during the day with school and/or work so by the time we find out about these things it’s late evening. But by those hours half of us are so insane that we have just enough energy to create graphics like the one above ;). EDIT: (Posted @ 8:55 AM Friday, September 21st, 2007) This news is no longer a rumor. Dentsu (Geneon’s Parent Company in Japan) released a statement confirming the news here, and ADV released a statement through ANN here. Dentsu states that Geneon has withdrawn from the deal, but they do not give any reason (neither does ADV). Dentsu goes on to say that some other companies, including trading giant Sojitz and the Development Bank of Japan, are going to be making investments in ADV through the Japan Contents Investment Business Limited Partnership, a special partnership that promotes the export of Japanese Animation Content. As of October 1st, Geneon will be involved only in managing their works. Their distribution is still up in the air, and now we’re a little worried – who is going to release their series? We’ll be hunting down our favorite Geneon titles in case we may never see them again. Late Breaking News: Geneon and ADV Merge! For those who haven’t heard already, Geneon and ADV have a new “strategic alliance” that essentially puts ADV at the helm of the distribution, marketing, and sales of all Geneon titles come October 1st. Geneon will still be licencing anime in North America but ADV will now be responsible for getting these titles to the store. It has not been announced anywhere why this merger occurred, though many are speculating that a lack of advertising on Geneon’s part lead to less profits than they would have liked. So the big question that means a lot to our readers is, what does this mean for Sailor Moon? Readers may recall that during the last round of releases years ago, the series was split. The first two seasons were licensed to ADV, and the third and fourth seasons, as well as the movies, were licensed to Geneon. ADV’s rights to Sailor Moon expired before Geneon’s. Both companies have said so many times that they are still very interested in licensing Sailor Moon. So, if Naoko and Toei were to reach an agreement that the series could come to international markets again, and if the rights were granted to Geneon , ADV would still win a good chunk of the profits. Moreover , if Geneon got a longer contract than ADV, ADV would be able to do more with Sailor Moon. Which can be seen as fair dues as ADV was unable to release boxsets of the dub, and they did not have the rights to the subtitled versions of the first two seasons for very long (in comparison to the time Geneon had). Fans interested in all the gory details of the licensure in North America should check out the infamous Total Eclipse Article. One of my main concerns is still distribution and pricing. Sometimes popular ADV and Geneon titles can be found in larger numbers than ones that aren’t as popular in Canada, but the prices are still too high. ADV’s distribution is slightly better than Geneon, but it still leaves a lot to be desired. One of the things though I admired about Geneon was that at major anime cons in Canada, their reps would be standing at a retail booth filled with their titles, and they were very close in price to what you would pay in the United States. I remember at CN Anime 2004 I was happy to see the signature editions of S and SS going for $17 a pop. Where I was from, they were $28-30 -if I could find them in a store. Most fans in Canada don’t have a con they can go to easily and compounded with titles in short stocks in stores, it’s not a very good situation. If ADV can improve distribution of Geneon titles, this alliance may hold some hope. However, considering ADV’s distribution isn’t anything to rave about… they probably have a long way to go. And I had to agree with Zac Bertschy’s sentiments in his Answerman column. The booth will probably disappear and Geneon just won’t be the presence it used to be in the anime industry. Of all the reps I’ve had the opportunity to meet, they were the nicest and were always ready to listen to their fans at cons. Geneon is also a huge pioneer in terms of Japanese music, as they were the first to release many OST’s from their anime, giving many fans a huge sigh of relief! No longer did they have to go to great lengths to get music they liked! They even helped to bring singer Yoko Ishida, Angela, and other acts to North America. It will be sad to see these staff members go. Geneon president and CEO Eiji Orii was quoted as saying, “This is a great alliance. The efficiencies we’ll achieve ultimately will mean more anime for the fans to enjoy.” ADV’s co-founder and president also commented, “This alliance makes both companies stronger. Anime as an entertainment category is in competition with every form of entertainment, and our partnership with Geneon gives us the scale to help widen the anime market in North America.” We hope ADV can remember that North America means more than just the United States and that fans like having more than just anime to enjoy. Other Releases Here and Here. Late Breaking News: Same Song, Different Con. Tokyopop Is Still Attempting to Negotiate the Rights to the Sailor Moon Manga. Genvid was one of the first to report of this news story at Baltimore’s Otakon. At Tokyopop’s industry panel, A fan asked Katherine Schilling and Alexis Kirsch if they were interested in re-releasing the Sailor Moon series. Katherine and Alexis are manga editors at Tokyopop and were representing them at Otakon. Here is our transcript of their answer from the video posted at ANN. Fast forward to around 28 minutes to see this part. Katherine: It was the first one that Tokyopop did years ago, and it totally, yeah… we deserve to do a good version. Fan: But you are working on it right? Katherine: Oh we are pursuing it as much as we can, but sometimes there are some issues that are out of your hands for now. Fan: Have you considered about releasing any of her other work? Katherine:To a degree, to a degree… But there’s other stuff to consider first, and Sailor Moon is still in our hearts. We sent an email to Tokyopop earlier this week to clarify details about the comments that they made at Otakon, but as of this writing we still haven’t heard back from them. These comments that were made really aren’t antyhing new from Tokyopop’s end. Since 2004 we have read many reports that they have been trying to get the rights to re-release the manga. As of this writing it is still unconfirmed whether they are trying to get the rights to the old manga releases (the ones from the early 90’s) or to the new re-releases with the additions and act redistributions – though we suspect it is the latter. But what really surprised us was finding out that they considered to get some of Naoko’s other works over here – of which most if not all are available only through fan translations. Still, it’s nice to know that they still have such positive feelings towards the property, and that they do want to do a better translation. The translation the first time around wasn’t well received by everyone with changes in names and attacks, for starters. Despite this, it was one of the first titles in North America to start the “Manga Boom” over a decade ago. And fans would probably have a better chance to acquire the manga now, as manga used to be carried in short stocks in a bookstore’s small graphic novels section or on a shelf with any of the cartoons, humor, or comics section. Now manga has become so popular it is hard to find a bookstore that doesn’t have its own large section devoted to manga. This sort of got us wondering what the other two companies involved with the anime were up to. The general trend these days (when a series is brought to other markets), is that both a series’ manga and anime are usually picked up at around the same time – give or take a few months. We wouldn’t be surprised if another company was pursuing the rights to the anime at the same time that Tokyopop is going after the manga. Over the years, it seems that Geneon has definitely been more vocal than ADV (time and again) about re-acquiring the rights to the series should issues between Toei and Naoko be resolved. We even heard of a rumor from one of our readers, Furu, that Bandai Visual was seeking the rights to distribute PGSM to North America. We have been unable to confirm the validity of that rumor. But barely a peep from ADV, and this is the response we got to an email we sent to them earlier this week. Interested fans who want to know how hard ADV tried to get certain pulled episodes to DVD from their releases of the first two seasons should watch the last minute of the third video and the first bit of the fourth video here. The most striking point of the interview with Matt Greenfield (founder of ADV) was when he said “Sailor Moon has not exactly been handled in a logical manner in its release in this country.” We have to agree with them – and in looking at the release of the series in the early 2000’s, it really seems ADV got the short end of the stick in many ways. We’re going to spare you everything that went wrong with the handling of the series in North America, but the major ones that stand out in our minds are distribution (theatrical, home video/DVD and television), marketing, and merchandising.